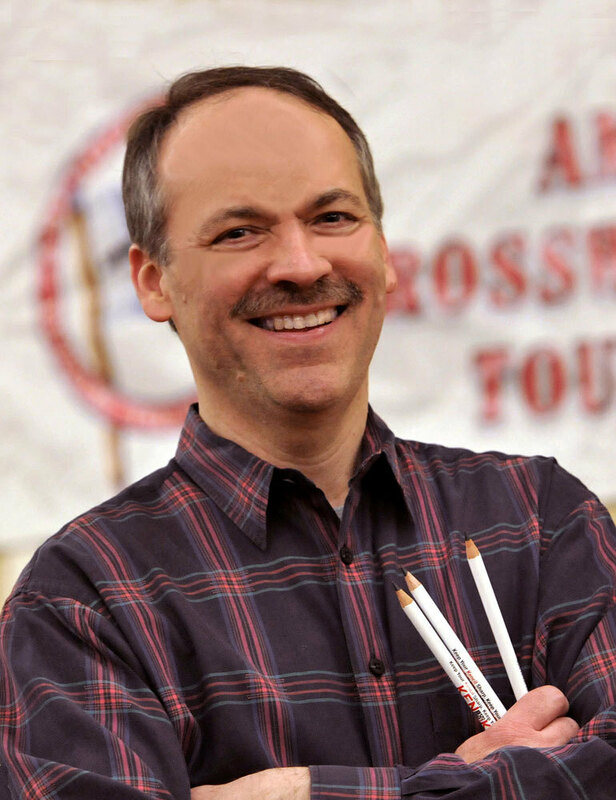 NPR's Puzzlemaster Will Shortz has appeared on Weekend Edition Sunday since the program's start in 1987. He's also the crossword editor of The New York Times, the former editor of Games magazine, and the founder and director of the American Crossword Puzzle Tournament (since 1978). Will sold his first puzzle professionally when he was 14 — to Venture, a denominational youth magazine. At 16 he became a regular contributor to Dell puzzle publications. He is the only person in the world to hold a college degree in Enigmatology, the study of puzzles, which he earned from Indiana University in 1974. Born in 1952 and raised on an Arabian horse farm in Indiana, Will now lives near New York City in a Tudor-style house filled with books and Arts and Crafts furniture. When he's not at work, he enjoys bicycling, movies, reading, travel, and collecting antique puzzle books and magazines. April 21, 2019  NPR's Lulu Garcia-Navarro and Weekend Edition Puzzlemaster Will Shortz play a word game with KANW and KUNM listener Kirstie Newman of Santa Fe, N.M.
April 14, 2019  NPR's Sacha Pfeiffer and Weekend Edition puzzlemaster Will Shortz play a word game with WAMU listener Ryan Saunders of Washington, D.C.
April 7, 2019  NPR's Lulu Garcia-Navarro and Weekend Edition's puzzlemaster Will Shortz play a word game with KUCV listener Eugene Clausen of Lincoln, Neb. March 31, 2019  NPR's Lulu Garcia-Navarro and Weekend Edition Puzzlemaster Will Shortz play a word game this week with KCFR listener Richard Bauman of Golden, Colo.
March 24, 2019  NPR's Lulu Garcia-Navarro and Weekend Edition puzzlemaster Will Shortz play a word game with KQED listener Nabil Tamer of Cupertino, Calif.
March 17, 2019  NPR's Lulu Garcia-Navarro and Weekend Edition Puzzlemaster Will Shortz play the puzzle with WCVE listener Gene Wolski of Henrico, Va.
March 10, 2019  NPR's Lulu Garcia-Navarro and Weekend Edition Puzzlemaster Will Shortz play a word game with WDET listener Elliott Shevin of Oak Park, Mich.
March 3, 2019  NPR's Lulu Garcia-Navarro and Weekend Edition Puzzlemaster Will Shortz play a word game with KQED listener Tracy Starr of Oakland, Calif.
February 24, 2019  NPR's Lulu Garcia-Navarro and Weekend Edition Puzzlemaster Will Shortz play a word game with WHYY listener Steve Fayne of Egg Harbor Township, N.J.
February 17, 2019  NPR's Lulu Garcia-Navarro and Weekend Edition puzzlemaster Will Shortz play a word game with WBUR listener Angela Voss of Medford, Mass. February 10, 2019  NPR's Lulu Garcia-Navarro and Weekend Edition puzzlemaster Will Shortz play a puzzle with WVPM listener Joe Sallmen of Fairmont, W.Va.
February 3, 2019  NPR's Lulu Garcia-Navarro and Weekend Edition puzzlemaster Will Shortz play a word game with WLRN listener Rob Olmstead of Clearwater, Fla.
January 27, 2019  NPR's Lulu Garcia-Navarro and puzzlemaster Will Shortz play this week's puzzle with KSTX listener, Erin Rodriguez of San Antonio, Texas. January 20, 2019  NPR's Lulu Garcia-Navarro plays this week's puzzle with puzzlemaster Will Shortz with Jeff Selleck of Alpine, Wyo. January 13, 2019  NPR's Lulu Garcia Navarro and puzzle master Will Shortz play a word game with Tova Tenenbaum of Philadelphia.